Help4Wales Foundation hosting fundraising music event! The Help4Wales Foundation are holding a fundraising music event to raise money for their animal fostering service! Help4Wales Foundation is a multiple award winning community interest company that supports victims of domestic abuse, homelessness and hospital admissions. They offer private and subsidised animal foster care in South Wales enabling those in difficult or emergency circumstances to access supporting services. As most refuges cannot take pets, finding a safe place can be a major barrier to women escaping abuse. 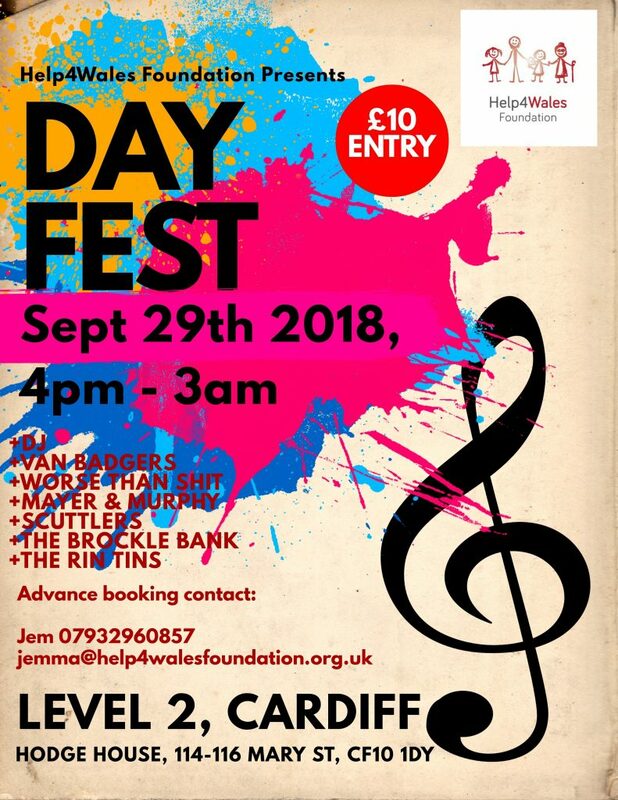 Day Fest will be help at Level 2 in Cardiff on the 29th September 2018. The theme for the event is festival and six bands and a DJ will be performing between the hours of 4pm- 3am. For more information or to book tickets you can contact Jemma by calling 07932960857 or via email on jemma@help4walesfoundation.org.uk. A Wales based community interest company set up to provide holistic support to those who need it.